Is tonight the night we get some answers about who Charles is? And what about Andrew? Are they the same person? The season of answers continues with tonight’s new episode of Pretty Little Liars. Nope. The girls have more important things to do. Like run out of an appointment with Dr. Sullivan to figure out who the heck Charles DiLaurentis is. But 4 points to the writers for remembering who that character is! I didn’t. When she’s not wondering if her dad is lying to her, Alison is pondering a second chance with Toby’s partner Lorenzo, who is probably way too old for her like every other guy on this show. 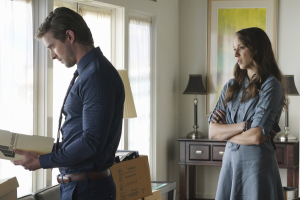 …Is that Drew Van Acker looks really good. Spencer turns to him for answers when Alison won’t give her any. Jason says that Charles doesn’t exist…but Charlie did. Or he thought he did. Charlie was Jason’s imaginary friend that one day had to go away when Jason’s dad told him so. Was he really imaginary? Where did he go? Did Jason have an older brother? Was Andrew that brother? Ezra manages to find out that Andrew’s birth records are sealed. Because he was adopted. Was he a DiLaurentis before he was adopted? A is still on the loose and holds a knife up to Sarah to send the girls a message. If Andrew is in jail, who could it have been? But Andrew isn’t in there for long as the police decide to release him. He is #BitterAndrew because he claims he was just trying to save the girls and they’re all toxic to the town anyway and blah blah go home Andrew. Aria finds a picture of Mrs. DiLaurentis with two boys in a hidden jar…one of them Jason. This town needs to get some curtains. Alison and Jason confront their father about who the boy in the picture is. Just as Mr. D is about to give some answers, the camera pans away to a stunned Ali and Jason as a hooded figure watches from the window. What are you theories after watching the episode? What did you guys think of Pretty Little Liars 6×03?